Thank you for visiting Amber Goods - Amber Jewelry web site! 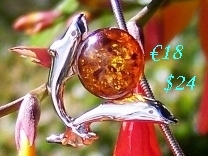 We are selling goods made of amber - amber silver jewelry, amber jewelry and amber lamps. Here you can buy amber jewelry online. We also do amber jewelry wholesale. Our amber jewelry is made of baltic amber gems and sterling silver (925). Online shopping: we provide FREE shipping and handling to Europe, United States and Canada. Our Easy Return + Refund policy allows you to return your purchase in 30 days for whatever reasons you have. Also Green Amber Jewelry now available. Our silver-containing Jewelry hallmarked by Irish Assay Office in Dublin. Amber is a fossil resin, named as "gold of Baltic" for its color. It is amazing that the color of each piece of amber is like if lighted by sun from inside. Million years ago large stands of forests in some parts of the world began to seep globs of sticky resin! This aromatic resin oozed down the sides of trees, as well as filling internal fissures, trapping debris, such as seeds, leaves, feathers and insects. As geologic time progressed the forests were buried and the resin hardened into a soft, warm, golden gem, known as amber. Amber is the fossilized resin of ancient trees which forms through a natural polymerization of the original organic compounds. Most of the world's amber is in the range of 30-90 million years old. Heating amber will soften it and eventually it will burn, a fact that has given rise to the name of bernstein, by which the Germans know amber. Rubbing amber with a cloth will make it electric, attracting bits of paper. The Greek name for amber is elektron, or the origin of our word electricity. Amber is a poor conductor of heat and feels warm to the touch (minerals feel cool). - from World of Amber web site - thanks! Amber deposits usually reside not very deep in the ground and that's why most of them are obtained from strip mines. There are also amber deposits in the sea. You could find small pieces of amber on sandy beaches of southern coast of Baltic Sea, especially after storms. What's so special about Amber Jewelry? We found amber transparency and its color the most interesting feature of jewelry made of this gemstone. Unlike diamonds, which are, by their crystal nature, close to 100% regular and let the light in in a very regular way, amber in jewelry make the light passing in a very irregular, one-in-kind way - because of differences in the resin properties, impurities that got into the resin before it turned into amber and different conditions the gemstone was created in. Note that raw amber is not usually that much transparent until gets polished and shaped into jewelry. Setting in sterling silver provides a nice, shiny contrast to the gemstone, what makes the amber jewelry looking more attractive. An interesting feature of raw amber jewelry is it's specific, very discreet, resin-like aroma (while polished jewelry is aroma-less). The aroma get more intense when amber is heated or burnt. See photos of raw amber necklace we offer. Diamonds have been called girl's best friend, and wedding bands are usually viewed as superb best friends. If you aren't at the wedding planning stage quite yet, sorting through a large variety engagement rings to find the best one should be treated with care. Amber Jewelry is not recognized that formal. However, once a bride-to-be designed herself and ordered from Amber Goods a number customized amber necklaces for her bridesmaids. This piece of our customer's jewelry art can be seen here. 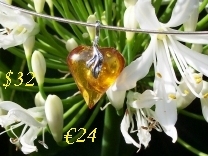 Amber jewelry photos taken in nature - flowers, trees, rocks in various locations in Ireland. We were trying to catch the sun rays as they go through amber, bend, split and get dispersed or reflected in the jewelry. There are some studio-taken photos as well, but again, in most cases the sun light seen in the amber jewelry is what we try to capture. The root of words like electricity, electronic, and electrostatic is the ancient Greek word elektron, meaning amber. The Greeks used pieces of amber in jewelry. They noticed that when amber was rubbed with cloth, it attracted light objects such as hair. The amber could pick these things up off the ground, overcoming the gravitational forces pulling them down. It seemed natural to attribute this behavior to the amber. Subsequently, anything that displayed similar behavior was likened to amber. The property of amber electrostatic charging comes from triboelectric effect - click to read more. Note that both web addresses www.ambergoods.com and www.ambergoods.ie refer to the same Amber Goods - Amber Jewelry - Amber Jewellery web site. Both home page addresses www.ambergoods.com/index.htm and www.ambergoods.ie/index.htm refer to the home page of this web site.